The City of London appears to be changing by the day with construction sites on every corner, however there are still some locations that have changed remarkably little over the past 70 plus years. 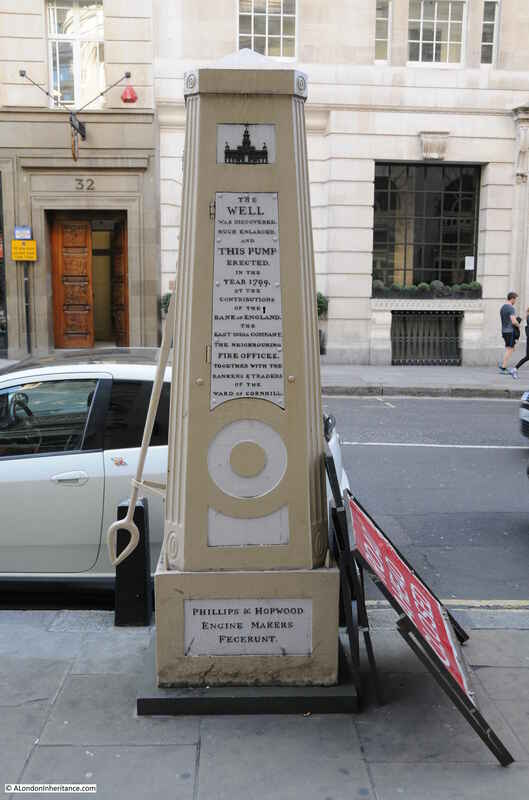 This week’s post is about one such location, centred on the Cornhill Water Pump. 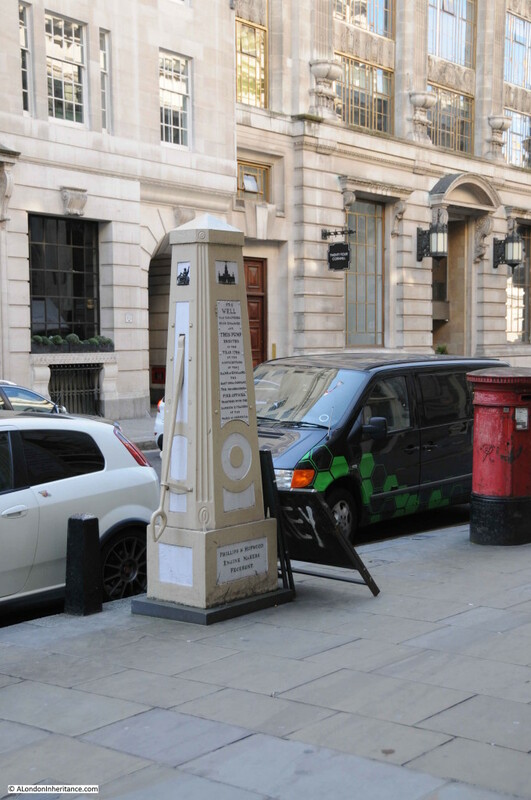 Cornhill is one of the streets that meet at the major road junction adjacent to the Bank of England. Originally the location of the north wall of the first Roman settlement, and later at about the centre of the city as Roman London developed from the original settlement. I will come on to the history of the pump, but what did surprise me as I was taking the photo is how little has changed. Not just the stonework of the buildings opposite (which have been cleaned in the intervening years), but also the windows, the large lamps either side of the door on the right and the stone decoration on both buildings. 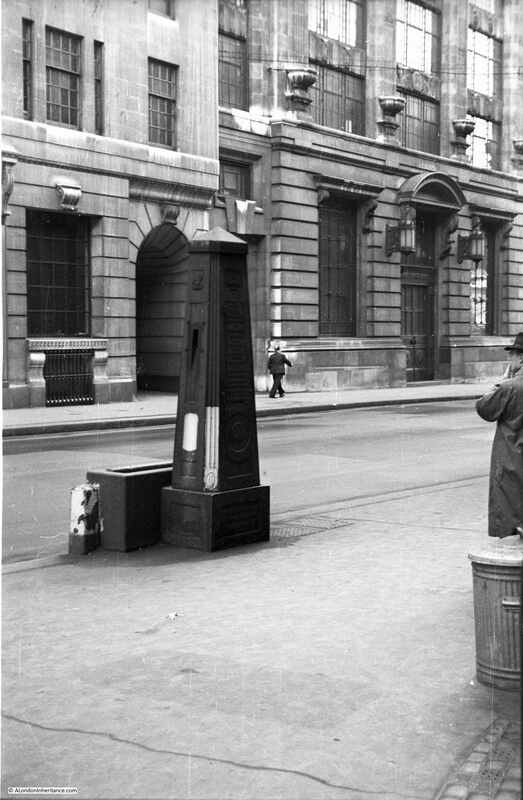 The man standing on the right of the 1948 photo could stand in the same position today and (apart from the traffic and the post box) see little change. 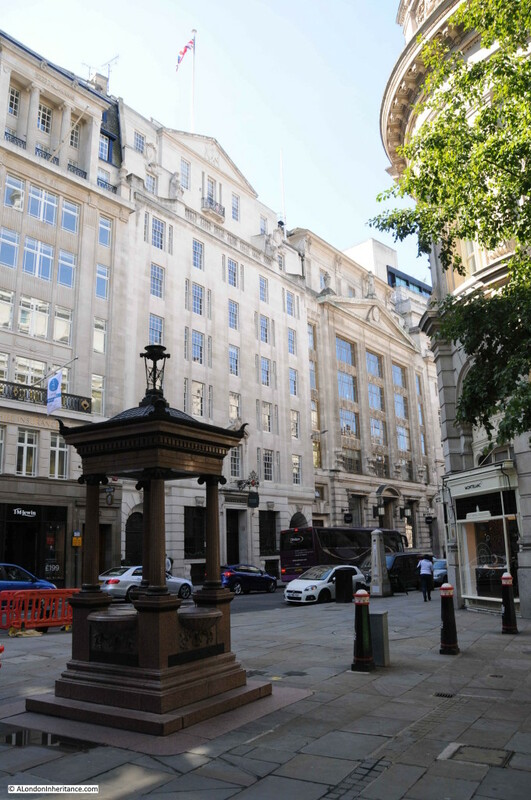 The building on the right of the photo was occupied by the Commercial Union Assurance Company, and to the right of this (just out of the photo) is the building originally built for Lloyds Bank. 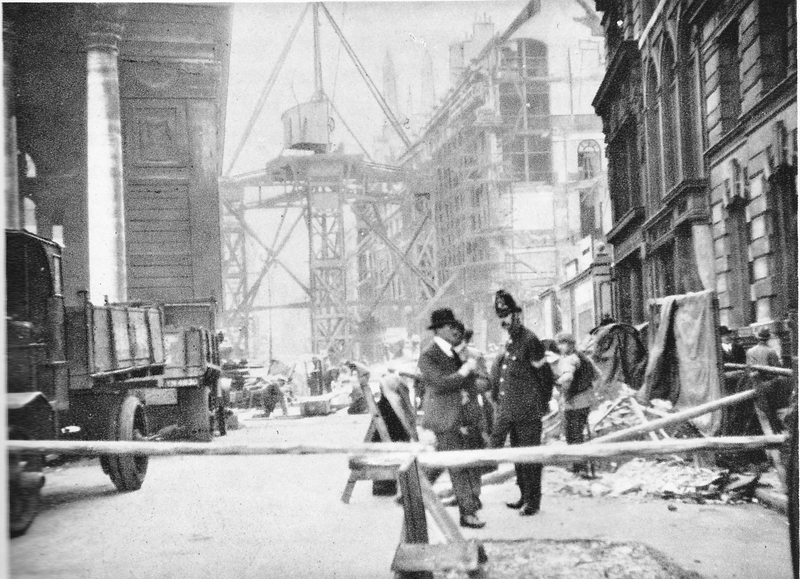 During construction of the Lloyds Bank building in 1927, the roadway in Cornhill collapsed, with the result that part of the original Commercial Union building also collapsed. The damage was so bad that the Commercial Union building had to be rebuilt. It was completed in 1929 and it is that building we see today. The collapse of the roadway was put down to the loose condition of the soil due to the Walbrook stream having once flowed across this part of the City down to the Thames. The following photo from August 1927 shows the collapse of the roadway. It was taken from the main Bank junction looking down Cornhill. The Royal Exchange building is on the left. Note the tripod crane structure occupying the whole of the road at the approximate position of the water pump. The view of the pump from the pavement. A real shame that it is also used as a prop for traffic signs. Besant also refers to several conduits and a spring in the area of Cornhill, but it is not clear whether he is referring to the location of the pump. There were many pumps and wells sunk all over the City, typically shallow and reaching a depth of 30 feet. They would have about 14 foot of water in the winter reducing to 3 foot in the summer. I am sure that 105 years later, Foord would be very pleased with the condition of the pump today. This was erected in 1911 and unveiled by the then Lord Mayor of London, Sir T. Vezey Strong on the 3rd May 1911. It replaced an earlier drinking fountain from 1859. The current fountain was built to commemorate the jubilee of the Metropolitan Drinking Fountain and Cattle Trough Association. 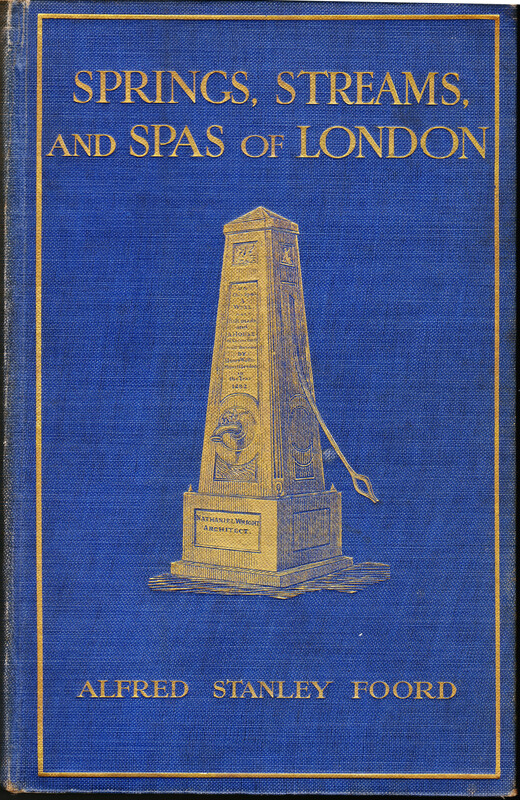 The fountain today, like the pump, is just decorative without a supply of water and therefore unable to fulfil the intended function, however they are both a reminder of the many water fountains, wells, pumps and conduits that helped provide water to the inhabitants of London over the centuries. 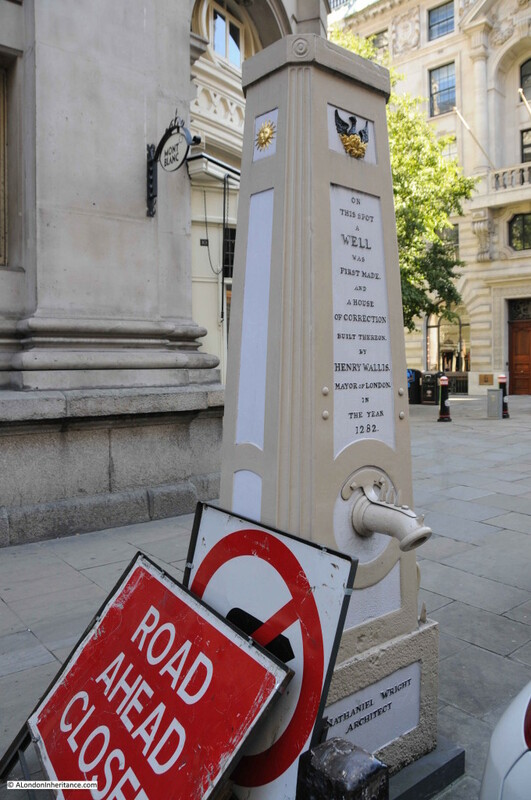 This entry was posted in London Monuments, London Streets and tagged Cornhill, Cornhill Water Pump, Drinking Fountains on September 27, 2015 by admin. Thanks for the feedback Gillian, really appreciated. The Walbrook cannot be blamed for collapses in Cornhill Street. Although its course is not entirely clear the southern part ran through Tokenhouse Yard, crossing Lothbury, and west of Bank (and the modern street Walbrook) to the Thames. Stow (and others) spell the Lord Mayor’s name Henry Waleis which can easily be imagined to be pronounced as ‘Wa-leys’. The section of Snow’s map representing areas in the city where the closest available source of water was the Broad Street pump included the highest incidence of cholera cases.